Elizabeth Calixtro was born in Oregon and raised in Morelos, Mexico. As a first generation college student – and her own family’s migration – Elizabeth acquired a passion for immigration policy, education policy, and human rights advocacy. Elizabeth is a Gates Millennium Scholar and a senior at Willamette University, where she serves as the first Latina student body president. She studied constitutional law, fundamental rights and politics for a semester at the University of Murcia in Spain and completed a junior summer institute program at the University of California Berkeley as a Public Policy and International Affairs Fellow. Elizabeth has also conducted independent research and fieldwork on immigration policy, domestic violence, and indigenous territorial rights through different research grants at Willamette University. She plans to continue this work by pursuing both a law degree and masters in public policy. 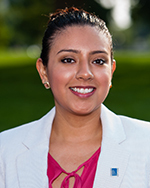 Elizabeth has interned for various offices and organizations including the Oregon State Legislature, the Oregon Secretary of State, CAUSA Oregon, and PCUN Farmworkers Union. Elizabeth is excited to participate in the CHCI Congressional Internship Program and learn about the ways in which Latino interests are addressed at the national level. She is particularly grateful for the opportunity to meet, work, and learn from other young leaders who share a passion for Latino advocacy. Becoming a Gates Millennium Scholar was definitely one of my biggest accomplishments because this scholarship was a doorway to many opportunities I never thought I could have. It afforded me full tuition to an undergraduate education, a wonderful study abroad experience, and a phenomenal network of students and professionals from similar backgrounds. I was selected as a Law, Public Policy and International Affairs Fellow at the University of California Berkeley three years later and that was an opportunity of a lifetime. We took graduate level coursework in Economics, Statistics, Public Policy, and Law and had the opportunity to hear from renowned professionals in the public policy arena. This fall I completed a Congressional Hispanic Caucus Internship Program in Washington D.C. working for a congressional member and assisting with legislative processes. I learned a lot about myself and about national politics. I am now back in Oregon, applying for graduate public policy programs and working as a Community Liaison in city government. I am exploring careers in public policy and like to take advantage of every opportunity I have to learn about the trajectories of leaders in this field at all levels of government. (Complete this sentence) I feel old when I…. see floppy disks used as coasters! When I was in high school I did not apply to the school of my dreams because I was afraid of getting denied. I still think about that to this day and I am glad I got a second chance in special admissions. Sometimes the feeling of not knowing what the outcome could have been is worse than taking a risk and finding out how far you can reach. I used to be insecure about my accent when I was learning English and it silenced me because I saw it as a communication barrier. I am now completely fluent in English and I still have an accent. The difference is that I now embrace it as a part of who I am and I like to think that it makes me unique because it reflects a history that I am proud of. Being articulate is not dependent on loosing a part of one’s self. Instead, I believe authenticity and self-awareness has provided me with the confidence I need to communicate effectively. I heard about ELGL through a current member who works in city government. She knew that I was exploring careers in local government and recommended this as a great opportunity to connect with young professionals in similar fields. I love kids for all kinds of reasons… one of them is that they are the most honest people you will ever encounter! Guidance for female professionals on negotiating job contracts. A comprehensive overview of different career options in local government. Most needed skills and educational backgrounds in local government. How do we prepare? Best thing about the 90’s was…… getting a baby brother! Best thing about the 00’s was….. getting involved in the immigrant rights movement. Megan Ybarra: caring, dedicated, fun, smart, so smart! Desiree Bell Kiesel: best coach, loving teacher, most-organized-&-detail-oriented-person-ever! When I was about 6 I watched Ana Barbara at a family rodeo. This year I watched Tigres del Norte at an Immigrant Rights Rally in Washington D.C. it was awesome… and free! I think one of the most important factor will be if I find that there were enough opportunities to connect with other members at events, etc. I think connecting with people in person is a great opportunity to build long lasting relationships and l look forward to learning about different career options in local government. Why are you interested in exploring local government? What leadership quality do you admire the most in people? What have you identified as your life mission? What keeps you motivated when your life mission seems overwhelming or impossible?